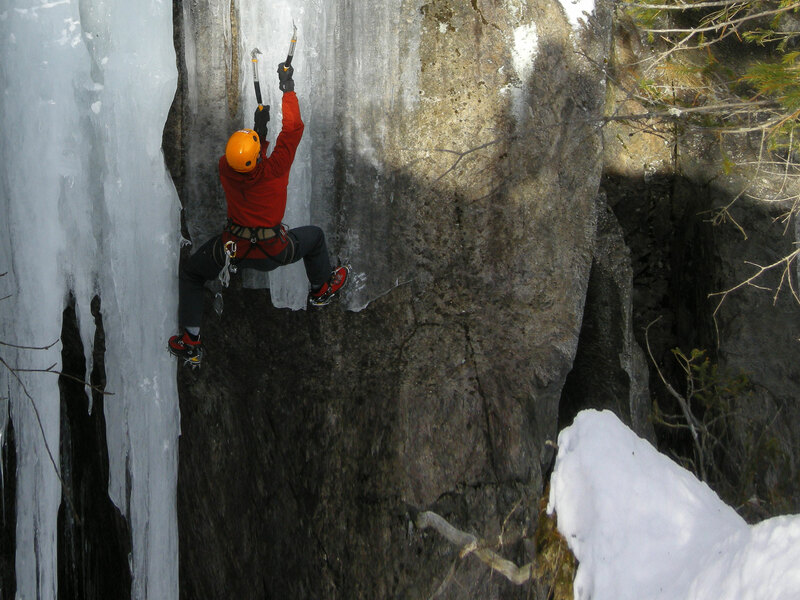 Simple tricks for ice climbing or: how to become a better climber. In addition to a permanent improvement of your karma, there are many details in ice climbing to which it is worth paying attention to. In the last couple of years, I have been swinging the tools a lot with a variety of partners. I love the idea to improve my climbing style in the icefall with different techniques steadily, thinking about how to do it with less effort and how to gain a higher safety margin. In this section I introduce various techniques and aspects, which I have come across. If you get a stuck tool regularly you’re likely placing them both at the same horizontal level. Try to avoid this, because it’s a waste of effort and time. Beside this it makes you far less secure while leading, because you have to wrestle a tool out while it’s off to the side. » It’s much better to place the tools roughly 30 to 60 cm vertically and roughly shoulder-width horizontally apart. Starting position for each swing should be a solid placement with both legs. Always keep this in mind! Once you have a bad foot placement, your swings will be less precise and you maneuver yourself into an unstable position. You finally end up standing badly with both legs, an unsecure tool placement on one side, swinging your tool with the other – a dangerous situation and no controlled movement at all. » After a swing, stand up completely and drive your hips towards the ice to finish the move. Most climbers don’t, which puts more weight on their arms. If you aren’t a complete novice but you are getting pumped forearms it is mostly because your feet aren’t at the same horizontal level or not standing solid. » Solid feet are a good base for relaxed hands. If one foot is low when you stand up it will come off, bringing you out of balance. Kick twice as much as you swing to get yourself into a better tool position. Many climbers hold their tools too stiff, so they can’t swing well in that position. The problem: a bad swing often resultes in an unsecure placement. » When holding the tool, my back of the hand is in line with my upper arm. For the right swing it is important to bend the wrist a little bit backwards (30° – 40°). The knuckles should be outwards as far as possible. Now you can turn the wrist better and your swing will be more effective. If the ice tool is in place I turn the hand inside (the back of the hand is in line with the upper arm) in order to hold the tool more effective. I swing and hold, and my hand always turns back and fore. Most of the ice climbers drop their elbow when they swing, which compromises accuracy, is a waste of effort, and reduces the vertical gain. Even worse is the “chicken wing swing”: with your elbow out to the side and the pick of your tool at roughly shoulder level. » Try to swing with your elbow high, and the pick, head and shaft of the tool all in line with your forearm and upper arm. It’s about getting the pick moving fast and accurately! At the moment of impact you have to give your tool an impulse out of your wrist towards the ice, so the pick hits the ice solid. Look, look, and look one more time! » Look carefully at the ice and its structures. Place your tools at corners, pockets, spaces between icicles, and kick in roughly the same places. It is important to look at the ice for every tool and foot placement. The advantages of a light mediterranean dish don’t work out well while ice climbing in winter. The energy consumption is high: during the day you are active in the cold, many hours directly in front of an icewall. So you don’t get very far with lettuce and radishes. During ice season I therefore switch to a more meat balanced diet. Meat contains special enzymes which activates the metabolism, and the body converts it into heat. » In addition to oat bars and power gels, sausages have proven to be perfect for a snack in between – they can be chewed quite well at temperatures far below zero and give the necessary energy for a day in the cold. Ice climbing is a stop-and-go-winter sport (climbing/belaying below zero, and mostly in the shade) with long periods in which the body isn’t in action. An important aspect that many beginners don’t mind! The reason for freezing the whole day is often too thick clothing during approach and climb, because then the body quickly overheats, increases sweating, and cools down afterwards. The result: unnecessary freezing while belaying and hardenings which will result in restrictions of movement. » The conclusion: sweat and you’ll freeze! Wear thin clothing during approach and climb (maybe wear a windstopper against hypothermia) to sweat as less as possible (especially at temperatures well below zero). If neccessary change into a dry T-shirt when you reach the icefall. If you stay dry your body doesn’t need to burn as much energy to stay warm. If it is very cold an additional down jacket makes sense while belaying. 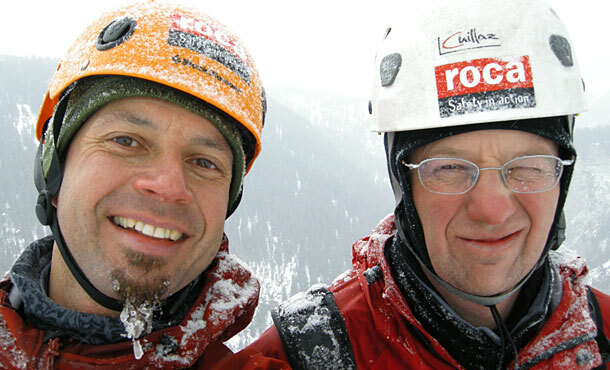 Therefore, I can recommend everybody to practice as much as you can – with crampons off, on, no tools, one tool, etc. Climb mainly as second to gain experiences with various ice structures, its textures at different temperatures and the right use of crampons and ice tools. Thus leads to more routine, more speed and higher safety margins. The step from follow to lead is huge – not at least because of the increased risk of injury. A clear head can make a big difference while leading. It’s in the nature of things, that human being badly adheres on the ice. Except he freezes on the surface, what I don’t wish anybody.